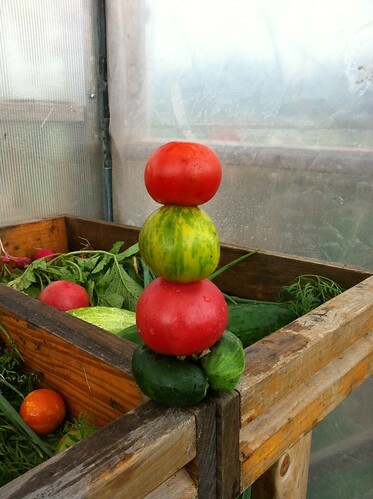 stack of tomatoes and cukes, a photo by sunnysidedru on Flickr. We start more than 100 tomato plants from seed under lights when it is still cold out. They get a bit of heat underneath too. As the weather warms we begin planting under the protection of the hoophouse..the hardiest varieties first. Shown here is the beginning of the tomato harvest: Glacier and Green Cherokee, an additional 8 types were planted. This week each share received one tomato and all the cucumbers we could get them to take, in just a few short weeks we will have buckets of tomatoes. The drip irrigation system has made a huge difference, with steady water input we get steady tomato output. Only compost goes on the plants, and we search for hornworms on a regular basis. Bees buzzing everyday in the tomatoes..as long as we keep tobacco smokers/chewers away from these beauties all should be well..